Every year around this time I get inquiries from people who are hoping to start their first blog in the new year. Which is awesome! I can’t recommend blogging enough. It is such a versatile tool that can open doors to new communities of people, no matter what your interests are. As a custom web and blog designer, you’d think that I would be all for these new bloggers hiring me straight off the bat. But having been in this field for a while now (and having been a brand new blogger myself) over time I’ve come to understand that for a lot of brand new bloggers, custom design isn’t always the best first step. You see, over the years I’ve worked with a lot of brand new bloggers. And some of them come to me with a great plan in place, we work together, and their blog looks great from the beginning while they’re building their online presence, and they are able to start monetizing their blogs sooner. That is the best case scenario, and it’s why I don’t rule out working with new bloggers altogether. Sometimes it really does work out! However, the flip side is that sometimes new bloggers work with me and then they never really get their blog off the ground because it turns out that they didn’t like the act of blogging as much as they thought they would. OR, as they blog their content changes and evolves, and then their beautiful blog design isn’t a great fit for them anymore. I get a lot of satisfaction out of helping my clients succeed online, so it bums me out when clients aren’t able to use their sites (that we both worked so hard on) to their full potential. So while I could talk to you all day about the value of custom design, I wanted to put this post out there in case you might be thinking that it’s the only way to get started online. It’s not. I understand that starting with a layout that is too plain or just ugly isn’t a good option either. To be honest, when I first starting blogging in college, my blog barely did anything for two years, partly because I kept it on a free (and totally boring) Blogger template because I assumed that anything else was outside of my budget, which wasn’t really the case. The cool thing is that there is a middle ground option that will allow you to get your footing as a blogger without having to shell out a lot of money up front. There are tons of great premium WordPress themes out there that give you a beautifully designed blog layout at the fraction of the cost of custom design. The beauty of premium WordPress themes is that you can often purchase and install them in a matter of hours. That feeling of motivation you’re feeling right now? That is precious, and if you’re anything like me, the clock is ticking. I’m not saying you should do anything hasty, but if you’ve got your blog name and domain (I like NameCheap) picked out, make moves while you’re feeling inspired and set that baby up! You can start blogging right away and you can always hire someone to install something custom later. I’m not at all someone who thinks you need to know the code of your site inside and out in order to start a blog. That’s what web designers and developers are for. However, by installing WordPress, installing your new theme (and any plugins you might need) you are arming yourself with some basic WordPress knowledge that will help you when you decide it is the right time to hire a professional. Planning goes a long way, but it’s not the same as actually doing it. You might have big plans about the focus of your blog and how you want to visually express that in your blog’s brand, but how do you know until you’ve actually tried it? It makes sense to invest less at the beginning, and then have a more established content base before you pull the trigger on full branding and blog design. One of the best things about getting a custom blog design is that your site can truly be tailored to your content. The topics you love to write about the most, your most popular posts, what you want people to know about you right off the bat… your site can literally be built around your goals. The thing is, it’s harder to determine those things before any content has been produced. Having already produced some content will help you get more bang for your buck when you decide the time is right to invest in a custom blog design. I’ve used the Genesis Framework from the very beginning- it’s the platform that I used as I learned to design for WordPress. There’s a great community that supports it and tons of documentation both on the site and produced by others. There are also a ton of great, free plugins that are available by using Genesis, which helps make the world of plugins a lot easier to navigate. The way Genesis works is there are two parts: the framework (which contains the code for all the features) and then the child theme, which sometimes contains features, but mostly controls the look of your site. This allows you to update the framework (and the features) without messing with the look and layout of your site. When you purchase a child theme on the Studiopress site, you can buy the framework and the child theme all in one purchase. The beauty of using a Genesis theme is that tons of designers (like myself) design custom child themes for Genesis, so when you’re ready for a custom site, the transition is pretty seamless if you’ve already got Genesis set up on your site. Sometimes I think it’s easier to browse by designer. Genesis isn’t the only option out there, but some of these designers do build their themes for Genesis. Have you used a WordPress theme before? Do you have any favorite sources that I didn’t mention? Add them in the comments! By the way, if you are in the market for custom design, get in touch! Even if I’m not the best fit for your project, I’m always happy to share some names from my referral list. P.S. If you’re starting a new blog and you need web hosting, I recommend checking out RFE Hosting and Bluehost. Note: there are a few affiliate links in this post, as I found myself referring people to these sites all the time. I truly recommend these services and products, and have personal experience using them. Thank you for your support! I used to just customize the basic Genesis myself, and while it worked now I want something more specific. So I’m looking into updating to new ones- I love the Restored316 themes! That’s a great idea, I love them too! So true! When you’re just starting out, most bloggers or even small business owners don’t need to invest in a totally custom design–work on your branding and content first! May I plug myself? I did just launch my own Genesis theme shop recently! http://shop.erineflynn.com I’ve only got a few themes, but will be adding more soon! Of course, I’m so glad you did! My list was definitely not comprehensive- love your work, Erin! This is such a helpful post Katelyn, thank you! My blog is in desperate need of an update, but to be honest I get so overwhelmed by all the options out there. I’ve looked into switching from Blogger to WordPress (and also Squarespace, but I just don’t love it), but I was unaware of the Genesis framework for WP- it seems like a great fit for me, and I’ve already found themes I like from your list of Designers. Thank you so much! Really great advice & links, Kate! I agree with you on so many points about people who are new to blogging! I was on typepad for sooooo many years and then when I switched to wordpress i designed my own “theme” with Artisteer. I’m sure as a developer you are cringing but it did get me by ;) I purchased a theme from Restored 316 over thanksgiving- she was having awesome deals! I am almost ready to launch the new site! Happy to have it be more a site and not all blog. Great post! 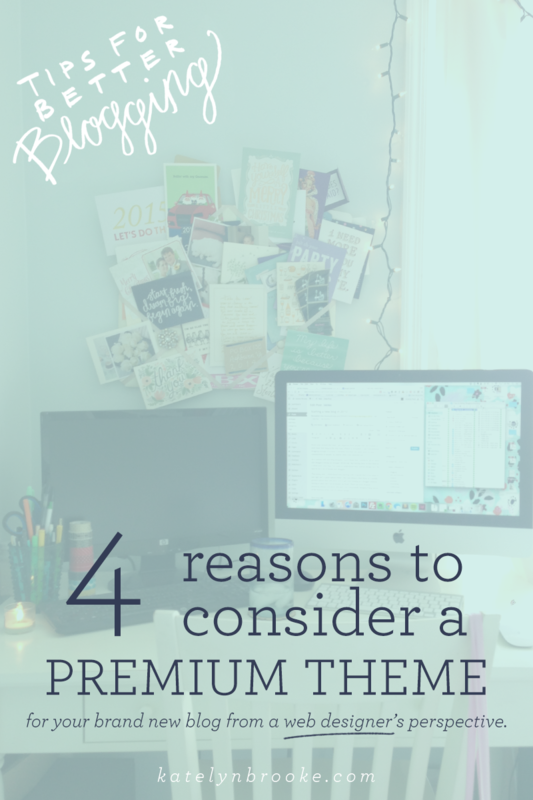 I agree, premium themes are such an inexpensive way to have a professional, functional blog! Loved your 5 favorite too! I just did a blog migration on Swank and it turned out great. I’ve actually been thinking about basing my new design on Whitespace Pro, I just can’t decide if I’m ready to get rid of my sidebar or not. Hi Kate! For this thing called Genedis, do I need to download both the framework and child theme? I want to get through to WordPress but I want to understand what I’m doing before I make all of these purchases. xo. P.S. You totally sold me on the premium themes idea. I’m glad I found this piece! Yes! You’ll need both the framework and the child theme, but if you purchase a theme from the Studiopress site itself (so one of the themes from the first list) I believe the framework comes with it, so you only have to make one purchase. Hi Katelyn, Maybe I missed this, but do you need Worpress.org to utilize Genesis or will WordPress.com work as well? Thanks! Unfortunately, as far as I know you can only use Genesis on self-hosted WordPress.org sites. You’re absolutely right Katelyn. A custom blog design isn’t always ideal. I would recommend first working on your content. And once you get in the “groove” of things, you can consider going the custom route. Premium themes are definitely a great way to customize your blog at an affordable price. Plus, with a few small tweaks, you can actually customize your theme to better suit your personal style! Katelyn! Thank you so much for the awesome shoutout to my ProPhoto blog designs. I love reading your blog and seeing all your beautiful work so I was so honored you mentioned me. Hi there, I’m brand new to all things blogging but hope to start my blog very soon. What is the difference between purchasing a premium theme and going with one of the free ones? Is it going to mess me up later if I want to upgrade? Hi Megan! It’s really just a matter if you can find one that a) you like, and b) has all the features you want. Most premium themes (like Genesis) include some SEO functionality and tutorial documentation that free themes don’t have. But if you can find one that you like that is free, you can always upgrade later!